MR STEPHEN Lee has seen Singapore through various crises and economic downturns, and is an institution at the Singapore National Employers Federation (SNEF). A key figure in carving out the tripartite alliance between the Government, employers and unions, Mr Lee will step down in September after 26 years as the federation's president. 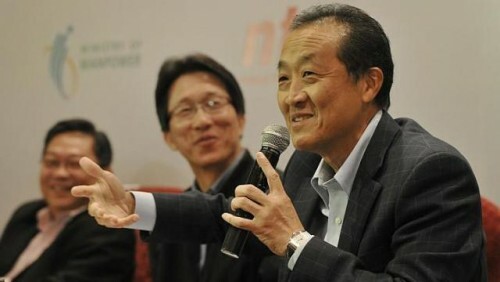 Mr Lee, 67, was elected president of the National Employers Council in 1977, to speak on behalf of employers. The National Employers Council and Singapore Employers Federation were merged to form SNEF in 1980. He is the chairman of Singapore Airlines (SIA) and previously chaired both port operator PSA International and government trade promotion arm International Enterprise Singapore. He is also a former Nominated Member of Parliament. Mr Lee is the longest-serving member of the National Wages Council, where he has represented the employers' group for the past 36 years. During his time at SNEF, he steered Singapore employers through four economic downturns, wage reforms in 1986 and wage restructuring in 2004. He also contributed in lifting the wages of low-income workers, extending the retirement age and implementing re-employment of older employees. For all his achievements, Mr Lee is widely respected by unionists and labour MPs as a good listener and expert communicator. As SIA's chairman, he met leaders from the SIA unions at coffee shops to resolve differences between the unions and management. Mr Eddie Chew, 65, former president of the Singapore Airlines Staff Union, said Mr Lee "does not have airs, even though he's very smart". "He comes down to your level and makes you feel comfortable... In negotiations, he's very firm but also willing to listen," said Mr Chew, who was the union's president for about 30 years and is now retired after stepping down in 2007. Former NTUC secretary-general Lim Boon Heng said Mr Lee is an employer who understands employees, and also gets along well with union leaders. He recalled union leaders inviting Mr Lee to a drink and a friendly game of poker some years ago. "The next day, he told me about it, and said he felt bad about winning their money. I am sure he made up for it with a good dinner and drinks later." Mr Lim added: "It is hard to find a person like Stephen Lee." Mr Lee has "the ability to communicate very complex things in an understandable and simple way, and therefore get people to support him," said Mr Alexander Melchers, SNEF's vice-president. "We've had to negotiate many challenges, such as the changes to CPF, and issues surrounding the re-employment of older workers, and Mr Lee was always very masterful at finding new ways to look at issues," he said.